Asthma is a chronic condition caused by bronchial tubes inflammation. When this happens, the sticky secretion produced in the tubes is increased and people start experiencing certain symptoms. Whenever the airways of a person inflame, fill up with mucus or tighten, a person may experience some of the asthma symptoms described in this article. As with other conditions, people with asthma may not have the same symptoms or their severity as the next person. Sometimes, an individual may have different symptoms or they can simply develop at different time or period of the day. Additionally, different asthma attacks may be characterized with different symptoms. In some cases, the symptoms can be mild during one attack and more severe during another. It is not uncommon that an asthma patient goes for longer period without any asthma symptoms. Such cases are often interrupted by asthma attacks that come out of nowhere. Other people experience the symptoms daily or when exercising or simply having a cold. The most common asthma attacks are neither unnoticeable, nor severe. Actually, the most common attacks are characterized by mild symptoms, where the airways open up after a little while. To be more precise, little while means a couple of minutes to few hours. The severe asthma attacks are less common and generally last longer. When such attack occurs, the patient requires medical help and does so immediately. This is why it is highly important that one treats every asthma symptom they develop in order to prevent attacks that are more serious. Recognizing the symptoms of asthma is the best way to keep this chronic condition under control. When we speak of early symptoms and signs of asthma, we are actually speaking of those warning signs that happen prior or at the beginning of the asthma attack. These symptoms are very likely to start developing before the common asthma symptoms. They are known to be the earliest signs of a worsening condition of asthma. In most cases, the early asthma symptoms are not severe and patients can barely notice them. They are not strong enough to prevent people from doing what they do every day, but recognizing them can really help a patient prevent a following or already began attack. 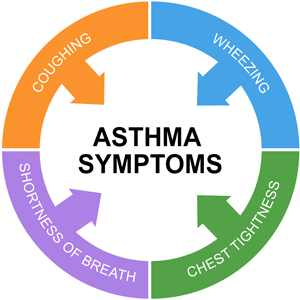 If you are experiencing any of these symptoms, you should follow the action plan for asthma provided by your doctor and increase the intake of asthma medication. If you do not have such plan, visit the doctor immediately. The episode that happens to asthma patients is called asthma attack. When the muscle surrounding the airways in the throat triggers to tighten for some reason, an asthma attack occurs. The tightening is also referred to as bronchospasm. When a person develops an asthma attack, the airways’ lining starts swelling up or becomes inflamed. This causes the cells to produce additional mucus that makes the airways tighten. Asthma attacks may start as mild but escalate quite rapidly. This is why it is highly important to pay attention to treating the symptoms right after recognizing them. A bronchodilator or asthma inhaler is the best ways to treat the symptoms immediately. Without using such instruments, the asthma attack becomes more severe and you may experience difficulty breathing. People who have been checked with peak flow meter while in asthma attack show reading of less than 50%. The normal is 100%, but for asthma patients the recommended intervention should start as 80%. You should never allow your asthma attack to worsen more than this. The lungs tighten and stop the air movement, so you will not be able to wheeze after a while. When they start to tighten, you will no longer have the chance of using peak flow meter. You will immediately need medical attention. Therefore, you should never see the wheezing disappearance as an improvement sign. Many people have done so and regretted the decision. If you do not start treating symptoms immediately after noticing them, you may stop being able to speak and develop blue lips. This is also called cyanosis and is the most common sign of lack of oxygen to the blood. Not treating people in this condition may cause them to become unconscious and eventually, dead. Any asthma action plan includes emergency instruction that you must follow when an asthma attack occurs. Up to 12% of all children in the United States are diagnosed with this chronic condition. It is considered that asthma is the leading cause of chronic illness in children in general and unfortunately, this statistic is becoming stronger within the minute. More and more children are becoming diagnosed with asthma almost daily. Symptoms of asthma are known to begin in every age, but the majority of children being diagnosed with this condition have the first symptoms by the age of five. Not every child that suffers from asthma starts showing signs of wheezing. Some children may start coughing often, which is the reason why parents can often miss this symptom of asthma. Usually, coughing is connected to other diseases, such as bronchitis. Very often, the symptoms of asthma can be mimicked by other conditions, such as vocal cord dysfunction, bronchitis and heart failure. This is why people need to understand the importance of knowing how their body shows symptoms, especially when it comes to asthma patients. After all, no person experiences the same symptoms, has the same triggers or severity of asthma signs. Infections, whether bacterial or virus, are one of the most common triggers of asthma. This is why it is highly important that people know the symptoms of infections in order to prevent worsening of the asthma. In some cases, the infection may not trigger the most obvious symptoms, so you should know how your body signs you that something is wrong. After recognizing the symptoms of an infection, it is highly important that you start taking asthma and infection medication to regain the control over your health. Symptoms often worsen if a person is not taking care of their asthma. Not treating asthma or avoiding the prescribed medications can only worsen the symptoms and disturb your quality of life. When you notice that you sleep badly, cough at night or have changes in mood, you really should see this as asthma symptoms. Additionally, you may feel shortness of breath that will stop you in doing the things you often do, such as playing with the kids, your children or grandchildren. If you allow these symptoms to get worse by not treating them, this can lead to an asthma attack that is life threatening. Try taking a preventer medicine that your doctor will prescribe to you. Such medicines are often prescribed to be taken daily, regardless of how you feel. Such medications can prevent asthma symptoms and attacks from happening. Following your asthma action plan will definitely allow you to avoid worsening of symptoms, but you would also consider doing regular visits at your doctor’s office. After all, good managing of the asthma and the symptoms can make you experience life with no signs of this chronic disease at all. Working on avoiding symptoms is a mutual job that you and your doctor must do together. If you manage your asthma, you may be symptom-free. This means that you will finally be able to enjoy your everyday activities. The job of a doctor is to find the right combination for you. In some cases, asthma symptoms are more severe than in others and this requires approach that is more careful and more thorough treatment plan. You cannot put up with asthma! You cannot avoid it or leave it for later, because this is a highly complex condition. Not treating or handling the asthma symptoms can only increase the life-threatening chances, so you must be careful. Luckily, there are many good asthma treatments and medicines daily that can make your life much easier. If you take good care of your health, you may as well enjoy a life free of asthma signs and symptoms.